YPA M613 Mysterious Cardioid Condenser Microphone The M613 is a cardioid, mini-condenser instrumental microphone with in-line preamplifier is designed to clearly capture the sounds of today's professional horn players. The pickup pattern of the M613 provides high gain-before-feedback and excellent rejection of unwanted noise. With a high maximum sound pressure level (SPL), the M613 is ready to handle the demands of brass and woodwind instruments, and is a strong performer for percussion applications. The transformerless preamplifier circuitry of the M613 improves linearity across the full frequency range. In situations where phantom power is not available, the A63P preamplifier will perform exceptionally. 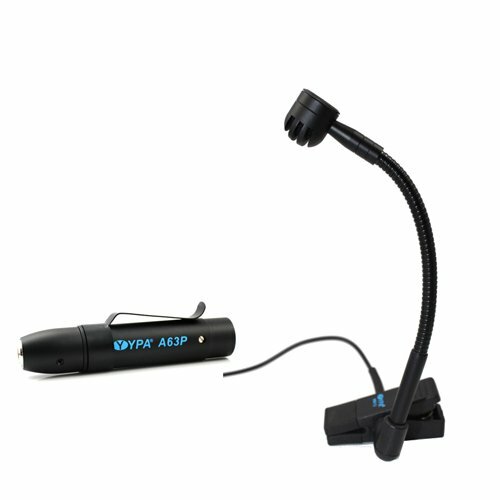 The integrated gooseneck and ratcheting swivel joint of the M613 allows for easy microphone positioning and securing. Once the position is determined, the gooseneck angle brace ensures that the M613 will stay in place during even the most active performances.